Modulo per encoder rotativo (non fornito) che visualizza la posizione tramite LED. Occorre collegarlo ad un microcontrollore. The Rotary Encoder LED Ring is a position indicator for rotary encoders. Traditional knobs with indicator lines do not give accurate representation of an encoder’s value since rotary encoders have no start or end point. 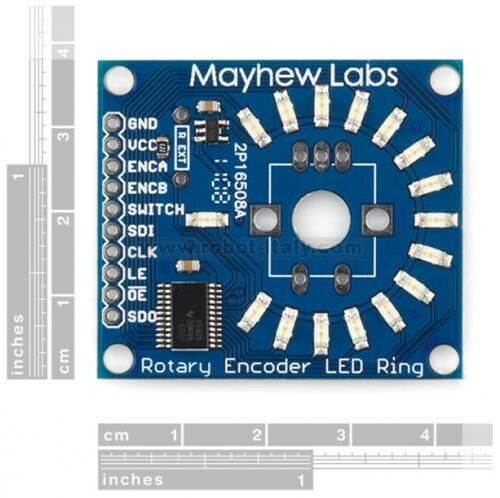 The Rotary Encoder LED Ring has thru-hole or shaft mounting for most standard encoders and uses a Texas Instruments TLC5925 shift register to interface 16 green LEDs to any microcontroller through SPI. A microcontroller can be programmed to output any desired sequence on the LEDs.